For logistics and transport operations every mile saved is a CO2 saving and a cost saving. MJC²'s green logistics optimization software enables complex operations to minimise distance travelled and reduce wasted or empty mileage through better planning and more efficient scheduling of resources. Fewer empty movements, smaller carbon footprint, reduced transport costs. 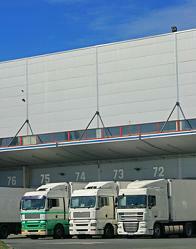 Integrated primary & secondary logistics leading to reduced GHG emissions. Round-trips and backhauls leading to smaller carbon footprint and cost savings. Optimized job allocation, reducing CO2 emissions and driving resource efficiency. Linehaul/PUD optimization leading reduction of fuel usage and drivers hours. Real-time planning in lean manufacturing operations, reducing waste and costs. Our supply chain planning solutions are applicable to many industry sectors and are used by high-profile organisations around the World. We provide integrated solutions that span all planning timeframes, from long-term strategic optimization systems through to real-time dynamic scheduling software.